Guessous Majda Mária (Meshi) is a Hungarian- Moroccan Junior Prima Award winner singer. She graduated from Liszt Academy of Music in Budapest as a folk singer artist and teacher where she teached since 2010. She is very grateful to her teachers who helped her a lot during her career such as Abderrahim Amrani (MA), Anna Vakler (HU), Erdal Erzincan (TR), János Sipos (HU), Judit Sáriné Szebenyi (HU), Mansur Bildik (TR), Mercan Erzincan (TR), Tamás Kobzos Kiss (HU) and Yusuf Benli (TR). 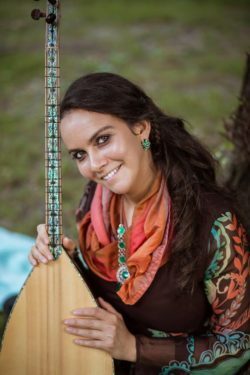 In her music she finds a creative way for bringing closer different musical traditions of the world especially Hungarian, Turkish, Arabic, and Indian music. With her musicians, they give regularly concerts in Turkey where they love them so much as their own actions and enthusiastically mediate to the Turkish media. The domestic Turkish community also likes them very much. They give regularly concerts in the Yunus Emre Turkish Cultural Center in Budapest and not only foreign, but also domestic – connecting the two nations –and already the audience also met important diplomatic event several times. She performs in different parts of the world, often invited by embassies. In 2018 Meshi received invitations to perform in Hungary, Germany, Czech Republic, Bulgaria, and Belgium. In 2017 she had concerts in Azerbaijan, Turkey, Kuwait, and in Saudi Arabias being the very first Hungarian singer performing there. In the years of 2015 and 2016 her voice reached to the audience of the USA, Turkey, Morocco, Kazakhstan, India, and Bahrein too. In 2017-2018 Meshi is also the rapporteur for the international portfolio of the Hungarian Heritage House (Hagyományok Háza), as a singer she popularizes Hungarian folk music as well as the songs of other cultures. Besides teaching she has a high sensitivity towards social issues. Being one of the artists at MUS-E, established by Yehudi Menuhin, she holds like art therapy sessions to socially disadvantaged children. In 2017 Meshi became TEDxYouth speaker. As the closing speech she held her presentation on the social initiative she had started called „Metamorphosis”. With all her being she experiences the wholeness of the differences either it is about the songs of different cultures or about different human fates. Meshi has performed together with several acknowledged artists such as Abderrahim Amrani (MA), István „Szalonna” Pál (HU), Károly Binder (HU), Mansur Bildik (TR), Marouan Benabdallah (HU-MA), Mike Stern (US), Rajeev Janardan (IN), Rajesh Gangani (IN), Said Tichiti (MA), Szabolcs Szőke (HU), Tamás Kobzos Kiss (HU), Tóth-Bagi Csaba (HU), Trilok Gurtu (IN), Yanis Benabdallah (HU-MA). These co-operations always inspire her professionally.